WhatsApp is basically killing my patience. I’ll be more specific. WhatsApp groups in particular are contributing a great deal in ruining my perfectly good mornings. The murder of patience began the day families decided that privacy was basically dead with ‘Good Morning’ and ‘Good Night’ was anywhere between 5 a.m and 11.30 p.m.
Then came the revolutionary types. Armchair revolutionaries. The ones who shared ‘Kraantikari’ posts in these groups hoping to spark a social change. Many issues have fallen prey to this phenomenon. The NaMo craze and politics in the lead. Next came religion. In a country that houses peacefully(?) around 330 million Gods, you would think people’s religious tolerance would be sky high. It is these WhatsApp groupees that make me sick today. And the reason is foolish and dark, both at the same time. The latest in the group forward is about how PK is an anti-hindu propagating movie with a script that indicates tolerance towards all other religions. Then the Indian girl – Pakistani boy love story angle is being majorly frowned upon. PK is the story about PK’s journey to find an object that is infinitely precious to him and is the only way he can get home. On his quest, he is introduced to the idea that ‘Bhagwaan’ can only help him. He pleads to all Gods, not knowing which religion to appeal to since he had no idea of his religious allegiance as he was not branded physically by any mark of a particular religion. His journey is honest and his prayers are heartfelt. The observations PK makes about religion, God-men and humanity in general are veracious. Objective, but definitely not baseless. When an Indian Girl falls for a Pakistani Boy after her initial hesitation in associating with him after finding out about his home country, the filmmaker is trying to bring across a point that her heart overruled her head. When PK rolled on the floor of a temple or took part in the Moharram procession, the filmmaker is depicting his character’s relentless faith in all the religions. There is not one instance in the movie where God as a supreme being is questioned. What is brought to question is how God-men cash on people’s blind faith and fear to craft a niche profit making business for themselves. In the movie, the plot revolves around a God-man who calls himself the representative of a popular Hindu God. The writers drafted the story that best suited the idea that took shape in their head. To brand it as communal and being opposed to only a single religious group is cuckoo talk. What is baffling is that the people giving wind to this controversy are the people I know personally. This is communal. It plants the seed of silent hatred in the minds of people who usually do not create opinions every time they watch a movie. My point here is that movies are the tools of independent creative expression. 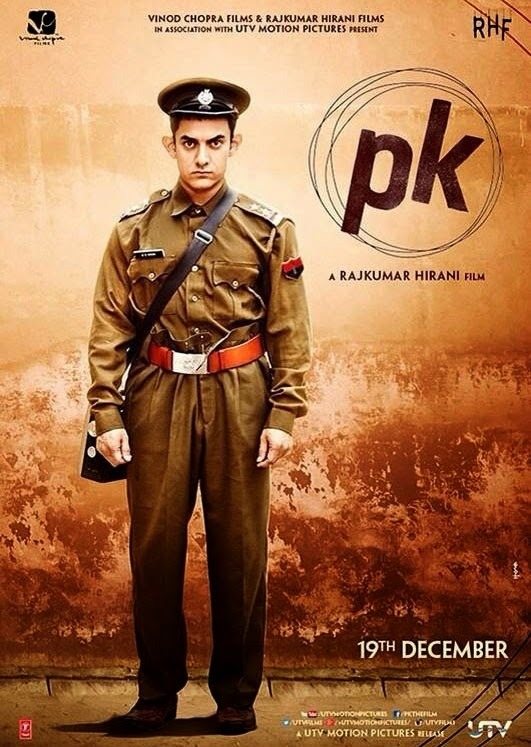 And to top it all, PK is a lovely sweet movie with a simple yet strong message. Just let it be! Please do not kill it’s buzz, not just yet. This is 2014 people, we are fighting on a crowded planet for survival. It does not take a lot to coexist and live happily. I admit you are a religious person, be fair and non-violent and spread happiness. Religion is for faith, happiness and observance. It is about convenience, not violence and hatred. And next time you walk out of a movie theatre, leave the negativity behind and take back with you all that is positive and good.